“For Almost a Month, Americans Failed to Detect Russian Submarine Near Its Shores” reads the headline on an article by Yelena Sidorenko in the Russian newspaper “Vzglyad: Delovaya Gazeta” (“The View: the Business Newspaper”) of Aug. 15. 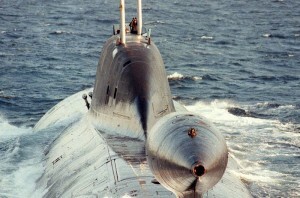 A Russian “Akula-B”-class nuclear-powered attack submarine of Project 971 (as it is classified by the NATO), armed with long-range cruise missiles, sailed undetected in the Gulf of Mexico almost for a month. The Washington Free Beacon cited the unnamed sources in reporting the incident, the second time since 2009 that a Russian submarine has sailed close to the United States. The favorite sons of our Motherland. While looking through my files the other day, I found a letter from Dr. Glazer, a Russian émigré, Professor of Biology at the City College of New York. After having spent the best years of his life in Stalin’s concentration camp in Siberia for allegedly “anti-Soviet pronouncements,” he was released and emigrated to this country sometime in the 1980s. “The problem of the Western, ‘free world,’ and this country in particular — he writes — is that it allows to freely destroy itself. And the sad thing is that during this process it is unaware that it is being annihilated. I am witnessing an interesting phenomenon — the factor of likability — during the current presidential election. And this just boggles my mind. Is this important for the well-being of the entire nation? Good looks, a dazzling smile, fluent speech to the point of being insincere or deceitful don’t make a good president. Obama’s likability factor is 92 percent! This good-looking man had almost four years in office, in which he has failed to prove he deserves another term. A figurehead who is being manipulated and backed by people such as George Soros, whose head is stuffed with Marxist-Leninist garbage and self-aggrandizement. Stop Obama from further destroying this country, this unique phenomenon called the United States of America!